When we first moved in here, I was mystified by the flattened oval pellets that clung to the walls and dangled from the ceiling. I thought they could have been some weird tropical insect or egg sac. Now I know what they are: Lizard poop. The lizards are just one of the many organisms that make up our little microenvironment here at Suan Parichat. We also have ants, spiders (one's crawling on my computer right now) and big lizards. Real big. In fact, one just slithered by the dining room window, flicking its tongue (HOLY CRAP, THOSE THINGS HAVE TONGUES??? ), so I grabbed my camera and tiptoed outside. I lost it, then saw its tail slide through the shadows under the deck just beneath my bare feet. I tiptoed back inside. Despite their size -- about that of a mutant sewer alligator -- monitor lizards do not like people and are usually scrambling for cover by the time they are spotted, one of the reasons I have not gotten a good picture. The other critters we share this house with, though, are not so shy. Like the geckos. As evening comes on, they put on their party dresses and go to town. They run up and down the walls and across the ceiling in full view of everyone. There's teeny ones, adolescent ones and mommies and daddies. They're called -- wait for it -- house geckos. As long as none of the geckos run across my face while I'm asleep, they can stay. Because we also have ants. Ever been bit by a red ant? I have -- twice since we've been here. It's like a sharp nip from the world's smallest Chihuhua. Anyone who read "Leiningen versus the Ants" in fifth grade knows that I got off easy. Last night was Whacking Day. I flipped on the kitchen light to find large black ants clustered around a piece of food at the edge of the sink. I grabbed a cereal box and began pounding. But I only screamed once, when some of them made surprise appearances from under dishes I was washing. I flopped on the couch with Leon to catch up on "Modern Family," but we realized that tiny red ants were converging on the cracker crumbs my son had dropped on the floor. This time the whacking was with a slipper and my Newsday flyswatter. We wiped up the smashed ant bodies with a damp paper towel and did a thorough recon for crumbs. Then I was hungry -- "All the murder," Leon said -- so I made popcorn. Getting ready for bed, I found more red ants in our bathroom, attracted by an open package of cough drops. More pounding, with "Bangkok: The Rough Guide." But the ant population had still not had enough punishment. 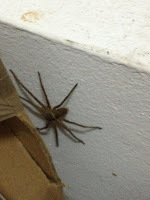 Two of the big ones were sitting on the landing when I went to check on Joe, so they had to be pounded with a slipper. It's not all fighting back the elements here. Last night was a beautiful evening and Leon and Joe went for a swim in the pool. I went into the storage room to get the binoculars for stargazing -- and there discovered the latest addition to our menagerie. Luckily, these guys eat cockroaches. Great story - a little un-nerving! Do the gecko's eat the ants? I guess they serve as "clean-up" reminders. If you don't clean up after yourself - here comes the minature clean-up crew! We actually have a larger clean-up crew at our house - the dog and the cat! It only takes a few times of "Wait, what happened to my burger? I just put it down on the coffee table, and now its gone! (paper and all)" and the guilty look on the dog's face to get the whole house in line! :) I sure hope the spider isn't poisenous! Quite an adjustment! Ha! I remember that about having a dog -- in fact one would be useful here to get the crumbs off the floor. Thanks, Pam! You have to be a pal of executive secretary Dorothy Bonardi to get a flyswatter. Next time I'm in NY, I'll see what I can do.